Fahmi Reza surveys his work. 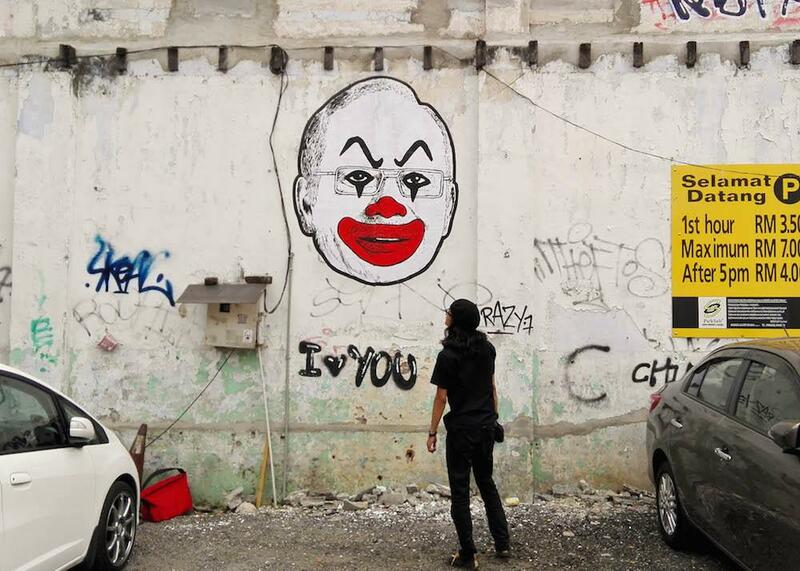 Malaysian artist Fahmi Reza is facing sedition charges for depicting Prime Minister Najib Razak in clown makeup, an image that originally appeared online but has since proliferated in street art throughout the capital of Kuala Lumpur. After learning of those charges on Friday, Fahmi and three other activists including comic artist Arif Rafhan Othman were also arrested on Saturday at a book festival for selling t-shirts and other merchandise that read #WeAreAllSeditious. They were released after questioning and have not yet been charged in that incident. Fahmi originally posted the clown image on Instagram in late January as a protest against Malaysia’s Sedition Act which has been used against critics including political cartoonist Zunar, currently facing up to 43 years in prison for statements he made on Twitter. Fahmi’s post read: “In 2015, the Sedition Act was used 91 times. But in a country full of corruption, we are all seditious.” On Friday he was notified that he is now being charged under the very same Sedition Act, which he has defiantly dubbed the “Hurt My Feelings Act.” He also faces a separate charge for digitally altering a Malaysian government takedown notice which he used in a satirical post on Facebook. Each count carries up to two years in prison and a fine of 50,000 Malaysian ringgit, or about $12,300. With his first court appearance scheduled for today (Monday), Fahmi on Saturday accompanied some friends and fellow activists to an art show associated with the KL Alternative Bookfest, where they sold merchandise featuring the clown image with the Malay hashtag #KitaSemuaPenghasut, or #WeAreAllSeditious. According to the Singapore-based news site Today, Fahmi also managed to present “former Premier Mahathir Mohamad a copy of his colouring book titled ABC Politikus Malaysia that features a likeness of the 90-year-old under the letter ‘D,’ for ‘Diktator.’” After selling their wares all day, Fahmi and his compatriots Pang Khee Teik, Arif Rafhan Othman, and Lew Pik-Svonn were surrounded and arrested as they were loading the goods into Lew’s car, which was also seized by police and has yet to be released. You can arrest me, arrest my friends, confiscate my stuff, detain me, interrogate me, charge me, put me on trial, take away my rights and try to shut me up, but you can’t keep me down. No matter how hard you try to push me down, I will always rise back up. After pleading not guilty to the sedition charge in court today, Fahmi urged other Malaysians to join in and speak out. “I’m prepared to go to jail for my art, for our right as citizens to speak up against corruption, against injustice,” he told the Malay Mail. “So yes, if it means I have to go to jail then I’ll go to jail for that.” He will make his second court appearance, for the charge regarding the digitally altered Malaysian Communications and Multimedia Commission notice, this Friday.